Note: Some screen options on the Post Administration Panel are hidden by default if they have not been saved before. Hidden by default: Excerpt, Post Author, Discussion, Custom Fields, Slug, Comments, Send Trackbacks, Revisions. 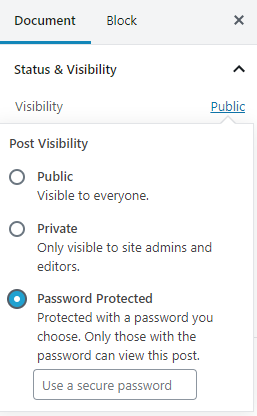 To unhide these options, there is a small tab called Screen Options in the top right of the page, just under the WordPress administration bar. Just check the boxes for to display and use these options. Contains buttons that control the state of your post. The main states are Published, Pending Review, and Draft. A Publishedstatus means the post has been published on your blog for all to see. Pending Review means the draft is waiting for review by an editor prior to publication. Draft means the post has not been published and remains a draft for you. 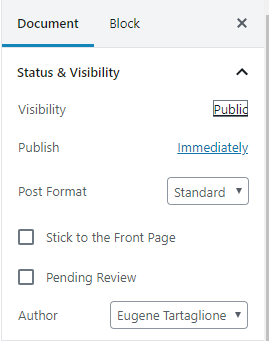 If you select a specific publish status and click the update post or “Publish” button, that status is applied to the post. For example, to save a post in the Pending Review status, select Pending Review from the Publish Status drop-down box, and click Save As Pending. (You will see all posts organized by status by going to Administration Panels > Posts > Edit). To schedule a post for publication on a future time or date, click “Edit” in the Publish area next to the words “Publish immediately”. You can also change the publish date to a date in the past to back-date posts. Change the settings to the desired time and date. You must also hit the “Publish” button when you have completed the post to publish at the desired time and date. Permalink stands for “permanent link”. That means a post URL that does not expose the post ID which could be subject to a change (e.g. when moving to different blogging system), but it rather contains a user-friendly post name derived from the post title which could also change, although not recommended, but in a more controllable way. This post name (also referred to as “post slug” or just “slug”) can be edited, depending on your Permalinks settings, using the “Edit” button. (To change your settings, go toAdministration Panels > Settings > Permalinks). The permalink is automatically generated based on the title you set to the post and is shown below the title field. Punctuation such as commas, quotes, apostrophes, and invalid URL characters are removed and spaces are substituted with dashes to separate each word. If your title is “My Site – Here’s Lookin’ at You, Kid”, it will be cleaned up to create the slug “my-site-heres-lookin-at-you-kid”. You can manually change this, maybe shortening it to “my-site-lookin-at-you-kid”. To password protect a post in the classic editor, click Edit next to Visibility in the Publish area to the top right, then click Password Protected, click Ok, and enter a password. Then click OK. Note – Editor and Admin users can see password protected or private posts in the edit view without knowing the password. After selecting the Visibility, choose ‘Password Protected’. After selecting this option you will be able to enter a password for this post. Edit next to Visibility in the Publish area to the top right, then click Password Protected, click Ok, and enter a password. Then click OK. Note – Editor and Admin users can see password protected or private posts in the edit view without knowing the password.